Republican Rep. Martha McSally is trailing Democratic Rep. Kyrsten Sinema in the latest survey ahead of Arizona’s Senate election. The two-term GOP lawmaker is behind her Democratic opponent by six points among registered voters, with McSally taking in 44 percent to Sinema’s 50 percent, according to an NBC News/Marist poll released Tuesday. The results were just outside the poll’s margin of error, which stands at plus-or-minus 5.4 percentage points. However, when Green Party candidate Angela Green is included in the survey, Sinema’s lead drops to three percent. The results indicate Sinema, a former anti-war activist, may be bouncing back in the polls after falling behind McSally, a retired military officer. Arizona is considered one of the Democratic Party’s best opportunities to capture a Senate seat — the other state being Nevada, where incumbent GOP Sen. Dean Heller is fighting a close election against Democrat Rep. Jackey Rosen. McSally gained a lead in early October following numerous revelations into Sinema’s activist past. Sinema – who was an ardent opponent of the war in Afghanistan – founded an anti-war group that distributed flyers in 2003 depicting U.S. soldiers as skeletons. Audio was released of her speaking during 2003 radio interview, which included her saying that she “didn’t care” if Americans took up arms with the Taliban. The news drew a sharp contrast to McSally, who served as an Air Force combat pilot before getting elected to the House of Representatives. However, Sinema has now led in the past two surveys out of Arizona, and the Democratic candidate has retaken the lead in the Real Clear Politics average, albeit by only .2 points. Sinema currently leads among those who have already voted, 51 percent to 47 percent. 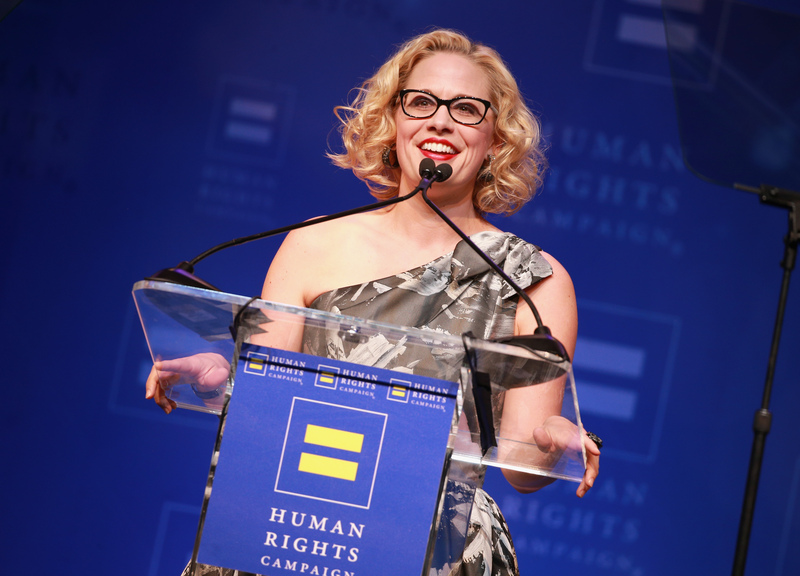 Beyond her anti-war activities, Sinema has also attracted controversy for past comments that include referring to stay-at-home moms as “leeches” in 2006 and calling Arizona the “meth lab of Democracy” in August. Sinema campaign staffers were recently caught on camera suggesting she cannot reveal her true stance on guns and immigration.